Morecambe boss Jim Bentley is looking forward to locking horns with a manager he looks up to on Saturday. While Bentley was coming through as a youngster at Manchester City the club captain was Keith Curle, manager of this weekend’s opponents Carlisle United. The Shrimps chief was Curle’s boot boy and had to look after the fellow central defender’s kit as well as his Adidas footwear. Bentley said: “Seeing him as a youngster of 16 or 17 when I was his boot boy and had to look after his kit and everything you could see he was destined to go into coaching and management. “He was organised, he was a leader and I saw myself like that as well. “I wanted to go into coaching and management and now we’re sharing the same touchline in League 2. “It’s funny how the game goes. As well as not being surprised at Curle turning his hand to management, The Shrimps boss hasn’t been caught out by Carlisle’s improvements under his stewardship this season. The Cumbrians have lost just one of their last eight in League 2 to move up to eighth having also lost out to Liverpool on penalties in the Capital One Cup this season. Bentley said: “He went in during a sticky period last season, stamped his own authority on it and upset one or two along the way by the looks of it. “But with what he’s brought in during the close season it doesn’t surprise me that they’re doing well. “They’ve got good players, including the leading goal scorer (Jabo Ibehre) in the division. ”They’ve won four out of the last six so it’s no surprise they can have a decent cup run and win away at QPR to set up a tie at Liverpool. “It’ll be a tough challenge for us but we’re coming off the back of a good 1-0 win (at Bury in the Johnstone’s Paint Trophy) on Tuesday. Curle is likely to be without his talisman Ibehre this Saturday with the 10-goal front man battling a hamstring injury. Bentley however knows it will be a difficult test whichever 11 takes the field at Brunton Park. 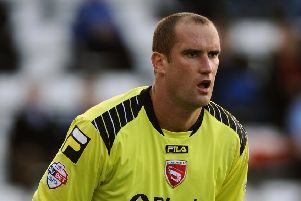 He said: “Marc Richards was out against Northampton and we conceded four. “It doesn’t matter who goes out. (Derek) Asamoah is a good player and they’ve got good midfielders there in (Jason) Kennedy and Luke Joyce who I’ve always liked.